Steve Jobs Co-Founder of apple known by many. 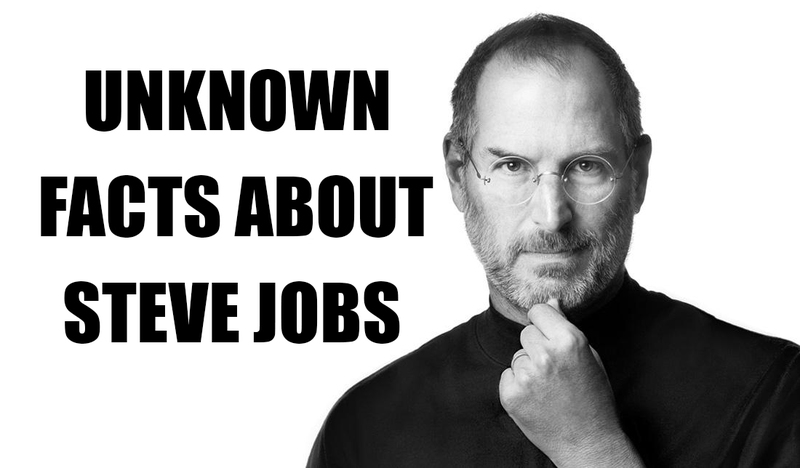 In this article i will list some mind blowing facts about Steve Jobs that you never know. 1. Steve Jobs never wrote a single line of code for apple. 2. Steve Jobs was adopted his father was a syrian muslim. Steven Paul Jobs was born on February 24, 1955, in San Francisco, California, to Joanne Schieble (later Joanne Simpson) and Abdulfattah "John" Jandali, two University of Wisconsin graduate students who gave their unnamed son up for adoption. Steve Jobs unknowingly met his biological father on multiple number of occasions. His adoptive parents, Paul and Clara Jobs, were Armenian and unable to have children. Steve was later joined in the family by his adopted sister Patti Jobs, born in 1958. The couple divorced in 1962. 3. Steve Jobs had no college degree. Steve Jobs dropped out of college after six months and spent the next 18 months dropping in on creative classes at the school. He struggled for making money during this time. Steve Jobs used to sleep on his friends room floors, returned Coke bottles for money, and ate free meals from the local Hare Krishna temple for living. 4. Steve Jobs Had LSD. Steve Jobs explained that he used LSD from 1972 - 1974 approximately 10 - 15 times. 5. Steve Jobs was dyslexic. 6. Steve Jobs worked for Atari. In 1973 Jobs started working at Atari as a technician. Steve Wozniak designed his version of the video game Pong. After finishing it, Wozniak gave the board to Jobs, Steve Jobs then took the game down to Atari. When the pair first created the Breakout game for Atari, they planned on splitting the pay 50-50. Although Atari gave Jobs $5,000 for the game, Jobs told Wozniak they got $700, leaving Wozniak to take home $350 while Jobs pocketed the other $4,650. While working in Atari Steve Jobs was asked to work for night shifts because of his stink smell as Jobs believed that his vegan diet would eliminate the need for showering. 7. India visit gave a vision to Steve Jobs. 8. Steve jobs applied for civilian astronaut to fly a space shuttle. Steve jobs got rejected and briefly considering starting a computer company in the Soviet Union,he resigned from Apple five months later. 9. Steve jobs annual salary from apple is just 1$. Steve jobs had 5 million shares that made him richer and moreover most of Steve Jobs' wealth was from his shares in Disney, not Apple. 10. October 16 was declared as Steve Jobs day by Californian governor. After battling a decade of pancreatic cancer Steve jobs died in October 5, 2011 and Steve jobs also turned down a partial liver transplant from Tim cook two years before dying of pancreatic cancer. Steve jobs was buried in an unmarked grave as per his family's request and the cemetery has not revealed it's location.